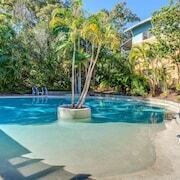 Located so close to parks and Dickey Beach. 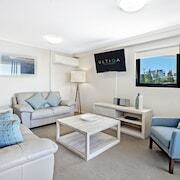 Several quality restaurants located nearby. 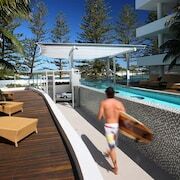 Nice resort close to the river Walking distance to restaurants, shops and Noosa river. 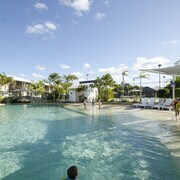 In the nice quiet area of Noosaville great swimming pool plenty to do at the resort great for kids. Wonderful Weekend Stay Only suggestions would be; - to have some oil/butter in the kitchen - the spa was cold and dirty Otherwise an absolutely gorgeous little townhouse, very clean, lovely service, great addition of food/beverage voucher - would definitely stay again. 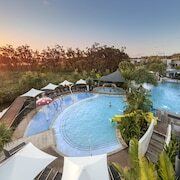 Whether you’re embarking on the trip of a lifetime with the extended family or just taking a sickie so you can have a long-weekend escape with your tween, Sunshine Coast family hotels are fun for all ages. 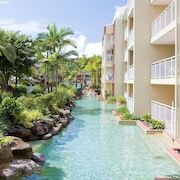 Offering things like activity areas, kids’ pools, lessons, child care and more, kid-friendly accommodation options can go the distance to add true relaxation to your bank of new favourite memories. You can easily get off the property, too; check out the action near the city centre, explore the local landmarks and chow down on the best of the best cuisine (no Happy Meals necessary). You’re busy remembering birthdays and anniversaries, so if you forgot to plan that next family getaway, no worries. 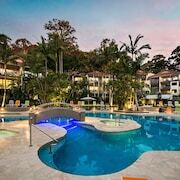 lastminute.com.au has the best deals on family hotels in Sunshine Coast and the widest variety, so finding your match is easier than saying your ABCs. Your trip will be so legendary, no one ever has to know it came down to the wire.